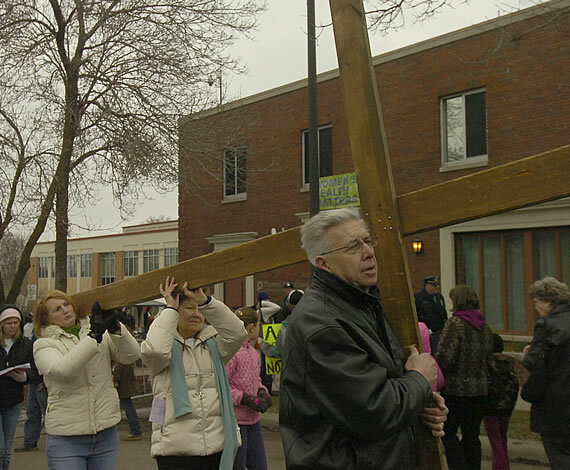 Dan Huschke, a member of St. Hubert in Chanhassen, walks in front of the Planned Parenthood building on Ford Parkway in St. Paul April 22 (Good Friday) carrying a wooden cross during the annual Carry the Cross of Abortion prayer vigil. 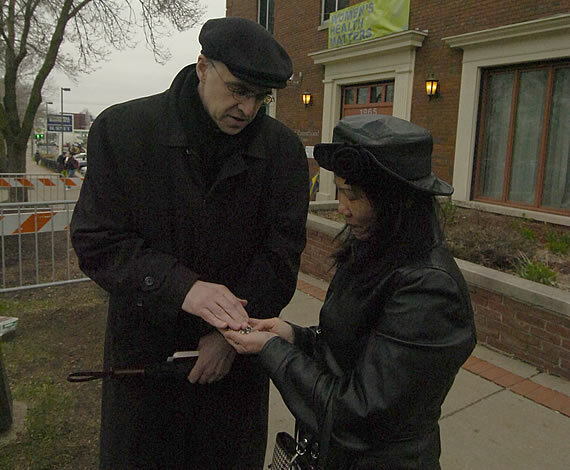 Father James Livingston, a priest of the Archdiocese of St. Paul and Minneapolis, blesses a rosary for Lana Nguyen, a member of St. Anne/St. Joseph Hien in Minneapolis, during the vigil. Archbishop John Nienstedt led the opening prayer and Father Livingston was one of several priests of the archdiocese and clergy of other denominations who took a turn reading Scripture and a meditation during the day-long event. This is the last time the annual vigil will be held at this location. Planned Parenthood plans to move to another location in St. Paul later this year. See more photos from the Carry the Cross of Abortion prayer vigil.